Ahoy, mateys! Shop our collection of Nautical Garden Flags. We offer a large selection of mini Nautical flags all in stock and for an affordable price. Browse our collection of mini Nautical Flags and discover the right flag for your yard and garden. 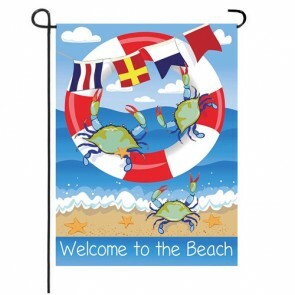 Our Nautical garden Flags selection features an array of small decorative flags full of lighthouses, pelicans, seashells, fish, crabs and more. Everything is in stock and at affordable prices! A typical Size Garden Flag measures approximately 12.5” Wide by 18” Tall and fits on any standard mini flagpole or flag stand. Buy From us and make HouseFlags your Home for Decorative Flags.